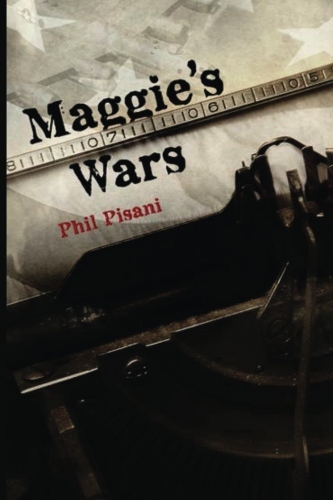 Maggie’s Wars by Phil Pisani is a novel taking place in the World War II era. This is Mr. Pisani’s first novel. The pub­lisher is giv­ing away 1 copy — enter via the Raf­fle­copter below. I wanted to read Maggie’s Wars by Phil Pisani because, as one might know, I’m a sucker for anything World War II. When I was promised a historical fiction novel about the era, I immediately said signed up. However, Maggie’s Wars is not historical fiction, it is a fictional story taking place in the past. The novel felt more like an outline then a well researched, yet fictional, book. Unfortunately Maggie was the least interesting character in the novel, even though she started out with a bang, marching into the Herald Tribune demanding a job which she got, but then had to deal with the sexist attitude prevailing at the time. However, nothing was ever being done about it, the protagonist was left a victim of sexism throughout her life and never overcame it. Johnny Stone, a mobster kid being drafted into the Army was a much more interesting character, but where his story fell short is during his service. I found it to be unbelievable that any military entity would send men on missions only to find out what their mission is when they hit the ground. Granted, in every mission there are many variables, but without clear guidelines that simply doesn’t happen, as romantic as it might seem. Johnny didn’t even know who he was paired with until they were in enemy territory – a great story but not very believable. If it was based on fact, the author didn’t provide any source material which I would have liked to see. I did enjoy the premise of the story, which seemed to be edited heavily to the point where character development took a second seat to length. A quick, quirky read with a noir feel about a feisty lady and a soldier, both trying to make a difference out of place. Maggie Hogan is a strong woman, an ace report who just wants to be treated fairly. She fights, and sleeps, her way through the battlefields, the Nuremburg trials and the aftermath of the World War II, including the cold war. Johnny Stone, Maggie’s on again / off again boyfriend finds his calling in the army and special services. As Johnny and Maggie fight different wars, they keep encountering one another in the most unexpected places.